1 of 2 Heat oven to 450 degrees . Trim eggplants and slice in half lengthwise. Sprinkle cut sides with 1/4 tsp of the salt and 1 tbsp of the oil. Place cut sides down on a foil-lined baking sheet. Roast at 450 degrees for 30 minutes, or until eggplant flesh is soft and skin has begun to collapse. Cool slightly. Scoop out flesh and break into bite-size pieces with a fork; discard skins. 2 of 2 Stir in tahini, lemon juice, lemon zest, cayenne, remaining oil and remaining 3/4 tsp salt. Garnish with fresh chopped parsley and, if desired, drizzle with olive oil. 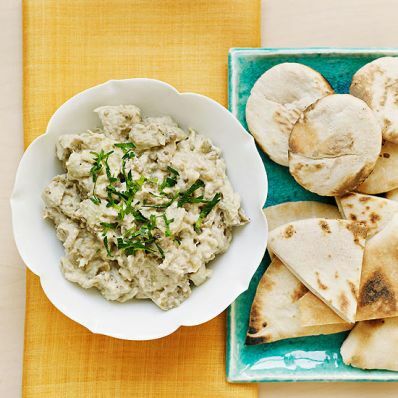 Serve with pitas, grilled, if desired, and cut into wedges. Per Serving: 131 kcal cal., 11 g Fat, total, 4 g fiber, 9 g carb., 1 g sat. fat, 0 mg chol., 297 mg sodium, 3 g pro.